I like this photo essay by Steve Collins called urban church. I’v got into the The Nick & Josh Podcast recently, I really enjoyed their interview with Doug Pagitt (here) and Pete Rollins (here). In a previous post a wile ago, I had been smitten by Mark Driscoll’s (from Mars Hill Church, Seattle, USA & Acts 29 Church Planting Network) new book: Confessions of a Reformission Rev. : Hard Lessons from an Emerging Missional Church (Leadership Network Innovation). In the book he talks about the Missional Ministry Matrix being: 1. our Christology determines how we do our 2. Ecclesiology this determines our 3. Missiology and this then determines how we do 4. Ministry. Over the last year of being a student with Bristol Center for Youth Ministry as well as working with Richard Passmore on Church on the Edge I come to have a 2.0 paradigm shift with my Missiology/Ecclesiology. Our Ecclesiology has to be birthed our of our Missiology. If we start with a church then I can’t see how we can do true mission. We will already have set ideas and structures in place. So the mission group will have to fit into a ’round hole’ to ‘do’ church. Yet if we start with the mission group, and form church around them, we would hopefully be working together to create something brand new that would be true to the culture we were reaching. I know that there would be lots of concerns about this, once again it is a threat to power, the ways things have always been done. This Missiology/Ecclesiology could get out of hand, could go ‘South’. Yes…it could. But, for so long we have been trying to change the church formulas to get them in and mission of sorts has been shaped out of these formulas. Maybe its time that we gave mission a chance to lead the way and see what creative, new and amazing churches could be birthed. 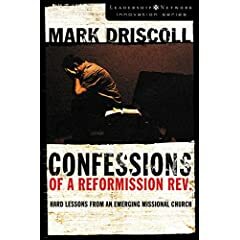 One of the most helpful and practical things that I have ever read regarding ministry was in Mark Driscoll’s (from Mars Hill Church, Seattle, USA & Acts 29 Church Planting Network) new book: Confessions of a Reformission Rev. 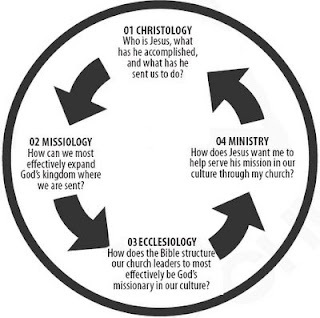 : Hard Lessons from an Emerging Missional Church (Leadership Network Innovation) . Through looking at these four areas, it will not only help me think though my current youth work but also future church planting.